Now that I have established a rating criteria for the meal delivery services, I decided not to make y’all wait until I tried three more for another review. I also decided to have Dustin rate the new ones as well! I received Home Chef last week and it was a great experience! Most of the other boxes were delivered in the late afternoon or night and Home Chef was delivered about 10 am. I actually came home during my lunch break to make sure I got it in the fridge. My friend, Mindy, sent me a coupon code, so a normally $59.70 meal was only $29.70. The three meals we received were: steak sandwiches, ginger salmon, and sausage risotto. We started with the BBQ steak sandwiches and they did not disappoint. The first thing I liked is that all the ingredients came packaged in separate bags for each meal. This made storage very simple and it ensured I didn’t leave anything out. This meal was fairly simple to prepare. The most time consuming part was mincing garlic cloves and parsley for the herb butter that was spread on the rolls before toasting. The ingredients all seemed very fresh and the steak was good quality. Overall, we really enjoyed this meal. The finished product is below. The second meal we made was the salmon. It was very tasty! It had an Asian flair to it with the teriyaki and gingers flavors. The green beans were so tasty and something we could easily make again. The salmon was so delicious! We seared it first, then popped it in the oven to finish it off. Probably my FAVORITE part of the dish was the garnish… It was so easy and looked amazing! When you slice green onions in thin strips and place them in cold water, they curl up and look beautiful! Who knew?! It really took my plating to the next level. The last meal was sausage risotto. 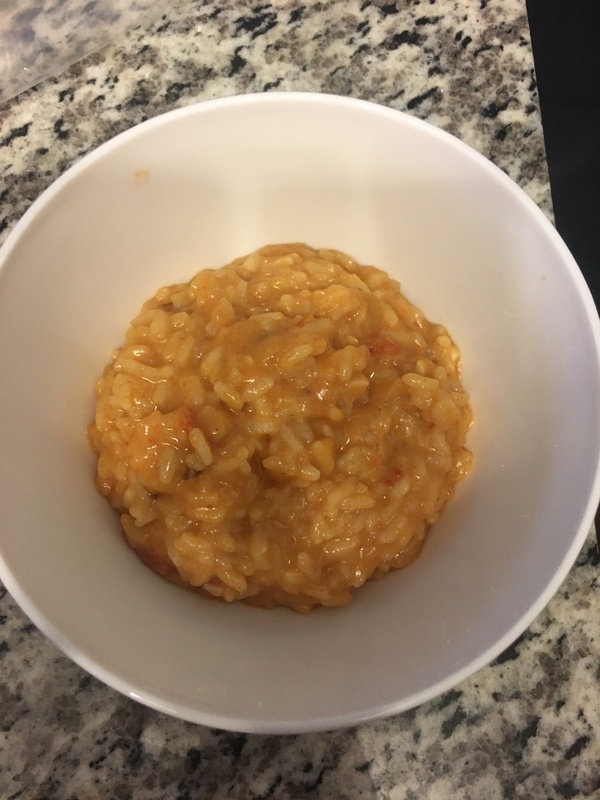 I had never made risotto before and although it took more time than I anticipated, I really enjoyed cooking it. I may or may not have set off the fire alarm while I had 3 pots going and an oven at 450 degrees, but overall it turned out great! Dustin is not a huge risotto fan, but even he liked this one! 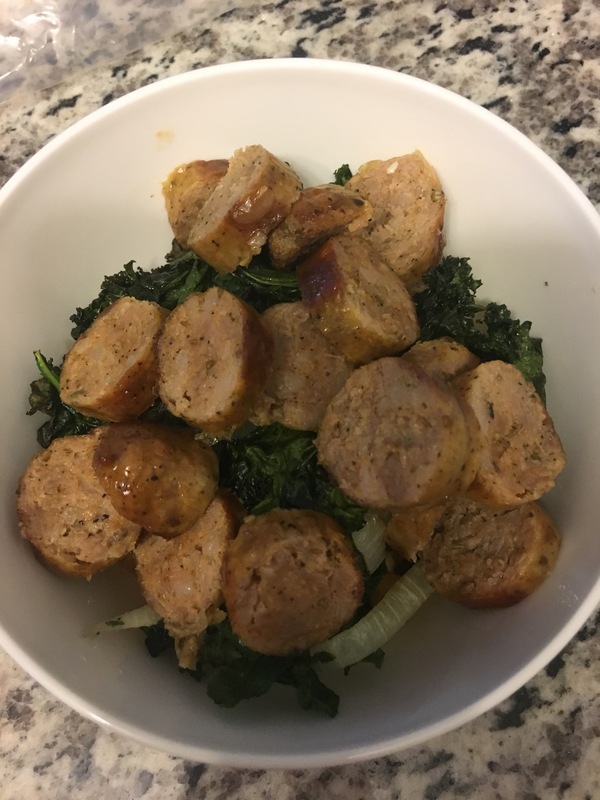 Normally, kale is a little bitter for my liking, but it tasted great with all the flavors in the dish. Overall, Home Chef was a great experience! There are so many options to choose from each week and they all sound delicious. I think we will be continuing to order from them in the future. To get $30 off your first meal, click here!